Jurassic World is slowly revealing its secrets to the ticket purchasing public, fulfilling John Hammond's decades old promise of "living biological attractions so astounding, they'll capture the imagination of the entire planet." With a teaser trailer and Super Bowl spot deployed and thrilling fans far and wide, there's not much more Jurassic World can do at this moment to tease the crowd without giving away huge swaths of the film's secrets. Thankfully, the ad wizards behind the film's marketing campaign have found a tactic worthy of the film's future pedigree: park security cameras! 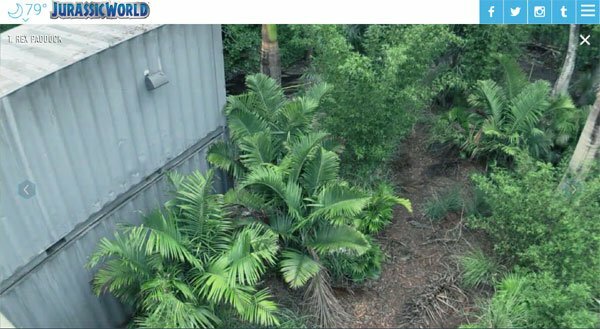 The official website has revealed a behind the scenes look at the goings on at Jurassic World, via a series of "park cams" that use in park surveillance to paint a picture of the fully operational and slowly stagnating dinosaur zoo. 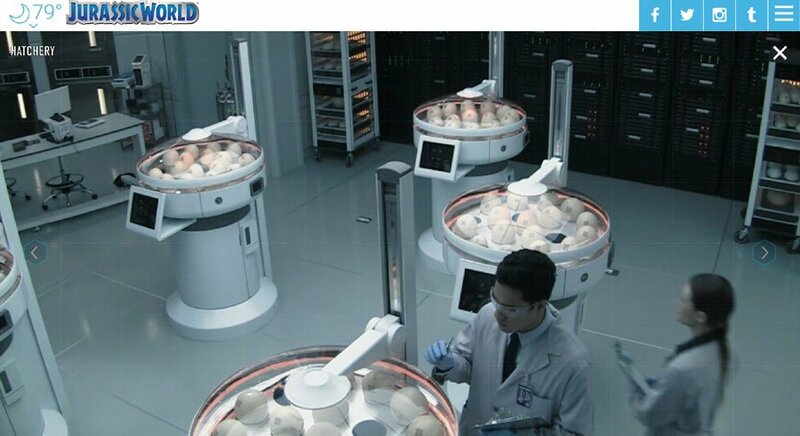 Judging by the videos we've seen so far, it looks like business as usual,with the cams looking around various populated areas of the park, as well as some of the laboratories. There are also some cameras set up to capture dino related action, including one in the Tyrannosaurus Rex cage, but sadly there's a bit of a dearth in dinosaur activity in this dinosaur park. Perhaps it was too expensive to get good looking CGI creatures for a viral campaign? A few things to keep in mind while watching these park cams: first, the cameras are still a bit wonky, as they've only been recently activated. One can assume there's still bug in the deployment of the site, as these were just brought online in the last 24 hours or so. Second, while there might not be too much dinosaur activity at this particular moment, the rest of the site has been pretty good with updating its content over time. It's a safe assumption that there could be a couple updates as the June release date grows nearer, with danger starting to creep in like a coming fog. So what are the Jurassic World park cams showing us so far? Well, they're showing us that things are rather comfortable in the park. Everywhere from Main Street to Winston's Steakhouse, and even the Gyrosphere line itself, is running in tip top shape. Everyone is smiling, happy, and active. On the other hand, there's some footage behind the scenes of the park that could be interpreted as rather worrying. The cam covering Maintenance Alley 6 seems to show Jurassic World employees rushing off to an area out of frame. This urgency might be a hint of the irregularities the park's latest addition, the Indominus Rex, is causing in the park's fragile ecosystem. With about four months left to its debut, Jurassic World has plenty of time to make up for the ground lost in its social media campaign. The park cam idea is a good way of informing the public of what the park run like on a normal day, as by time the film actually begins the conditions will be ripe for big screen disaster. Jurassic World opens its doors to the theatrical viewing public on June 12th. Hopefully they can find that T-Rex that seems to be missing from its pen.